Direct restorations have been placed in teeth for more than a century. During that time, dental caries has been claimed to be cured multiple times and/or definitively treated with numerous ideal direct restorations. However, caries still remains to be the most prevalent disease to affect mankind. Today, manufacturers, "key opinion leaders," researchers, academics, sales representatives and many experienced and inexperienced clinicians alike repeat similar claims as in the past. The word "ideal" and "gold standard" are used audaciously and casually in ads, lectures and conversations to justify or explain why a dentist should buy another "new and improved" product. Does the ideal direct posterior restoration even exist? Fig. 1: Gold inlay and gold foil restorations. Is gold still the "gold standard"? Photo courtesy of Dr. Allan Rappold. 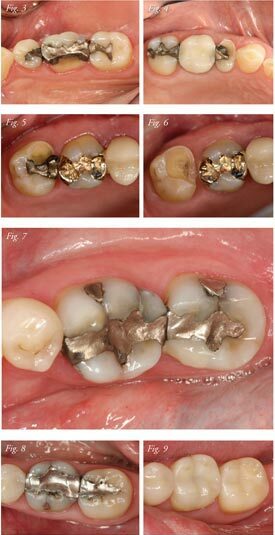 At one point, gold alloy and pure gold were considered to be the ideal indirect and direct posterior restorations (Fig. 1). In contrast, only a small percentage of the restorations currently placed use these materials. 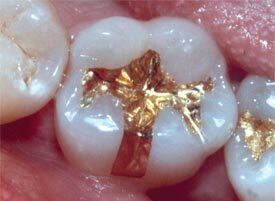 Ironically, gold alloy and pure gold restorations are often found to be the oldest and least carious in the oral cavity. Currently, many dentists choose gold alloy as the primary option for their own mouths, but are reluctant to offer it to their patients. As tooth-colored direct resin-based composite restorations and all-ceramic indirect restorations have become popular with the lay public, clinicians rarely offer gold restorations as an option to patients. The simple fact that tooth-colored restorations offer better aesthetic results seems to imply that they are superior in other aspects such as strength, wear and longevity. This misconception has led to abuse of the currently available aesthetic materials, cessation of proven techniques and safeguards and general ignorance of the shortcomings of the new and reportedly improved direct posterior restorations. The purpose of this article is to examine the two most popular types of direct posterior restorations – amalgam and resin-based composite – and provide direction on how they are best used within current limitations. For those who believe that amalgam or resin-based composite is the ideal direct posterior restoration, this article might provoke thought and reconsideration of product and technique selection. Presently, none of the available direct posterior restorations possess all of the ideal characteristics listed below. It is interesting to note the anxiety and controversy this statement involves, to infer that the most common procedure provided by dentists does not provide the optimal properties for restoration of teeth. Many clinicians have been taught or misled to believe that whatever they have placed in a patient's mouth is the ideal restoration because it is the newest, most popular or touted by an expert. The following list represents most of the ideal desired characteristics of direct posterior restorations. Compare your current choice of direct restorative material with the following list and see how many of the characteristics are actually present in your clinical procedures. Manufacturers to develop a direct restorative material that meets most of the above characteristics with the long-term goal to provide all of the characteristics; ensure that marketing claims are ethical, truthful and can be proven with both clinical and invitro research. Clinicians to provide proper informed consent to patients with all options for direct restoratives, their benefits and limitations and average longevity in the oral cavity; recognize current limitations with direct restoratives and to do your best to compensate for the limitations with improved skill and proper technique. Patients to better understand the materials that are placed in their teeth and to be informed of their choices. Fig. 2: Well-placed and non-carious amalgam restorations at 25 years. Amalgam continues to be either loved or hated in all areas of the world with many dental offices refusing to offer this type of direct restorative. Tooth-colored resin-based composite is now believed by many clinicians to be highly superior to amalgam. Some clinicians make their income by removing non-carious, unaesthetic, clinically acceptable amalgam restorations and promoting the still-controversial allegations of mercury toxicity. This practice of encouraging patients to remove sound amalgam restorations by preying on public and patient anxiety for profit is unethical and highly questionable of a "professional." Despite their unaesthetic shortcomings, amalgam restorations are still supported by the ADA, WHO, FDI and the FDA and are an acceptable and viable treatment option for direct posterior restorations. Fig. 3: Fractured DB and DL cusps of a mandibular molar with staining and minor caries; an onlay or crown would be the optimal restoration. Fig. 4: Fractured facial cusp of maxillary premolar with staining and minor caries; an onlay would be the optimal restoration. Fig. 5: Fractured maxillary MB cusp with an older mesio-occlusal amalgam restoration; note the long-lasting gold inlay now forgotten but rarely taught. Photo courtesy of Dr. Sameer Puri Fig. 6: Removal of amalgam restoration demonstrates minor caries and staining; a CEREC-fabricated onlay was the final restoration chosen. Photo courtesy of Dr. Sameer Puri Fig.7: Twenty-year-old fractured and patched amalgam restorations, recurrent caries and fractured cusps that require onlay or crown placement. Fig. 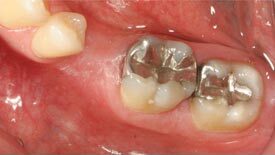 8: Questionable amalgam restorations more than 25 years in service; is it best to leave them alone? Fig. 9: Completed resin-based composite restorations demonstrating lack of severe caries; will these new restorations last 25 years? Many amalgams serve for several decades (Fig. 2). It is common to experience fractured cusps, due to preparation technique of undercuts and the wedging effect of amalgam (Figs. 3 & 4). Most amalgam restorations cause staining of dentin and residual caries (due to the bacteriostatic properties of silver) (Figs. 5 & 6). Large amalgam restorations that involve most of the tooth with no other option but an onlay or crown still function relatively well (preferable an onlay when at all possible) (Fig. 7). Old amalgam restorations that have discolored and stained the tooth, but with little evidence of recurrent caries (clinically or radiographically) (Figs. 8 & 9); these restorations should be carefully examined over time and potentially replaced when necessary. The main advantages of amalgam as clearly demonstrated and proven over many years of successful use are: bacteriostatic, easy to place and shape, durable, strong, have longevity and low cost. The main disadvantages are: unaesthetic properties, staining of tooth structure and propensity for fractured cusps due to preparation technique (excessive tooth removal for retention) and expansion/ contraction characteristics dissimilar to tooth structure. In searching for the ideal direct posterior restorative, it is evident that amalgam has many of the ideal characteristics, namely bacteriostatic, longevity and strength. Amalgam is often reserved for patients who are limited in financial resources, have high caries risk or have minimal third-party benefits. Ironically, it is these patients who might benefit most from amalgam's bacteriostatic and longevity properties, while the patients with more adequate insurance and financial resources receive aesthetic but non-cariostatic materials. When deciding about your continued use of amalgam, carefully consider each characteristic. If you must choose to use amalgam for a highly visible first pre-molar, discuss with your patient the benefits and limitations of all of the restorative options. When considering the potential graying of tooth structure if amalgam is used, against its proven longevity and known bacteriostatic properties, you might decide resin-based composite is the best option. However, when treating a maxillary second molar that is not visible when smiling, you might recommend an amalgam restoration. 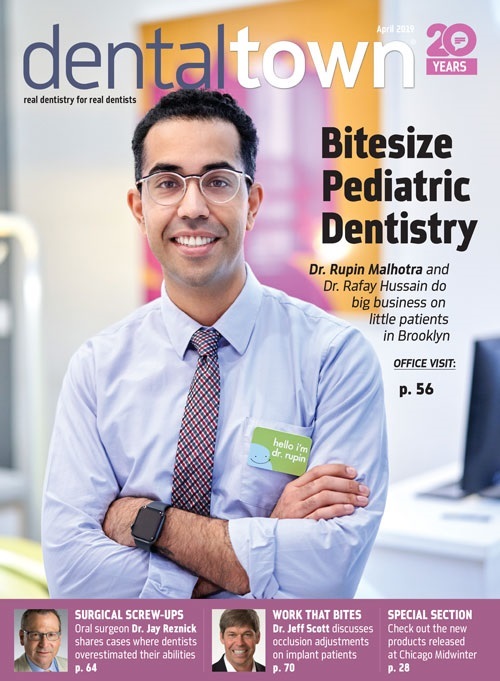 It is equally important to consider each patient's caries risk potential and estimated needed longevity in his or her oral cavity based upon their habits, history and health. Resin-based composite (RBC) has been continuously improved over the years and manufacturers are striving to meet the ideal characteristics listed above. However, two of the most important characteristics have not been adequately met, bacteriostatic properties and increased longevity. It is known through both research and observation that posterior direct resin-based composite restorations do not possess the same longevity and bacteriostatic properties as amalgam (Fig. 10). Yet, they can be highly aesthetic and have revolutionized the aesthetic/cosmetic desires of dentistry. In which clinical situations are the aesthetic characteristics of a material more important than the other properties? The emphasis of resin-based composite material by both manufacturers and key opinion leaders as a solution for most restorative dental needs is unfortunate. The resultant overuse of RBC is at the expense of patients. Adequate informed consent is required, including candor regarding its longevity in comparison to other restorative materials. Many third-party benefit providers in the U.S. will reimburse a portion of the allowable amount after only five years. Despite this, each time a restoration is replaced more tooth structure is removed with a decrease in strength and an increase in microbiological assault. As a result, many of the "first composite replacements" become crowns instead of onlays or another resin-based composite restoration. Fig. 10: Is it radiolucent flowable resin-composite or recurrent caries after only four years in service? All restorations exhibited recurrent caries with two direct pulp caps in this 32-year-old moderate-caries risk patient. Fig. 11: How long will these well-placed, large resin-based composite restorations last before recurrent caries is detectable? Fig. 12: Recurrent caries was evident under both restorations (first molar example of failed sealant). Despite the limitations mentioned above, including high cost, technique sensitivity of the product, high overhead for time spent, poor reimbursement rate and an always-changing choice of materials claiming to be superior to the previous versions; resin-based composite restorations for direct posterior use are improving. Manufacturers are making sincere efforts to solve some of the challenges that have continued to plague these restorations for decades. New "universal" adhesives that can be used with or without phosphoric acid etching for direct and indirect restorations are being introduced to simplify the race to be the next superior "generation." Flowable resin-based composites, which have been one of the most abused dental materials, are being changed to include stress-reducing properties at a lower shrinkage rate. Some companies have redesigned their flowables in response to practitioners placing it in increments that are larger than original recommendations of less than 0.5mm. The new flowables compensate for practitioner abuse by decreasing stress and shrinkage at a larger placement depth. Bulk fill or "dentin replacement materials" are being introduced that actually meet manufacturers' claims. Adhesives are being combined with resin-based composite to simplify procedures. Many of these new introductions are major steps in the right direction (as middle stage products) but presently manufacturers have not truly addressed the issues concerning bacteriostatic properties, longevity and lifetime maintenance of dentin bond strength over time. If these three limitations were presently met by any system, we would not observe the higher caries rates among this class of restoration. Fig. 13: Rubber dam isolation is still the gold standard! Fig. 14: Properly contoured, finished and polished resin-based composites on mandibular premolars. Note the existence of occlusal embrasures and marginal ridges on the premolars, unlike the second molar. Rubber dam isolation: still the gold standard in reducing contamination from blood, saliva and other contaminants (Fig. 13). Conservative preparation: extension for prevention is no longer the accepted treatment standard, nor is the preparation technique for amalgam the same as for resin-based composite. Disinfection: TRAC Research (Dr. Rella Christensen) has demonstrated that two one-minute coats of a 5% Glutaraldehyde/35% HEMA product (i.e. Gluma by Heraeus Kulzer, MicroPrime by Danville, etc.) disinfect tooth preparations and eliminate bacterial contamination. Adhesive: use a well-proven adhesive that maintains consistent bond strength under varying conditions. CR research has demonstrated in pilot studies and unpublished research that procedures as simple as varying the amount of air pressure and time thinning an adhesive can change bond strengths from 2MPa to 50MPa. Flowable: use of a resin-based flowable composite in the box of a preparation, based on the claim it adapts better to walls, is not a reason to use this high-stress, high-shrinking product. If flowable is used, use it at 0.5mm increments, or use a product that has research to prove it can be placed in thicker increments with decreased stress (i.e. SureFil SDR by Dentsply Caulk). Glass ionomer products: use of a resin-modified glass ionomer as a liner or base is recommended for its preventive chemistry, decreased sensitivity and insulating properties. 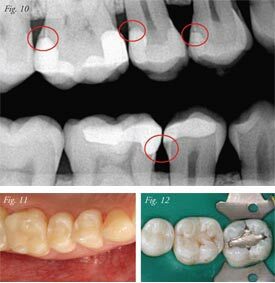 Placement of composite: place the material in minimal depth increments (usually 2mm or less) while being careful to avoid pull-back or introduction of voids. Some newer bulk-filling composites allow for placement up to 4- 5mm, while maintaining low shrinkage and stress. Finishing and polishing: take time to carefully finish restorations, providing adequate marginal ridges, simple occlusal anatomy, avoiding sharp angles (that usually chip within one year), avoiding heavy occlusal contacts and overfinishing of the margins (which creates gaps and another area for micro-leakage and bacterial assault) (Fig. 14). Follow-up: monitor the restorations and check them radiographically and clinically on a routine basis. Examine the restorations for excessive wear, chips, open margins, staining and caries. If you have to repair, do it sooner rather than later. Both amalgam and resin-based composite for direct posterior restorations have advantages and limitations. However, neither material has all the ideal characteristics. Providing patients with adequate informed consent for choice of treatment, materials, benefits, risks and limitations is not only ethical, but realistic as to how these new advanced materials hold-up over time. Exciting new products will continue to inundate the profession with claims of being superior. We advise caution. Providing patients with resin-based composites is not a high-revenue procedure for most dentists, yet it is imperative that we improve our techniques to compensate for the limitations of the products until the ideal direct restorative material is introduced.